A recently completed cooperative study between SCDNR, Auburn University, and Brosnan Forest is expected to help researchers and hunters better understand doe deer movements, behavior, and response to hunting pressure during the breeding season. According to SCDNR Deer and Wild Turkey Program Coordinator Charles Ruth, this is one in a series of cooperative studies conducted in South Carolina made possible by revenue associated with deer hunters' participation in antlerless deer tag programs offered by SCDNR. 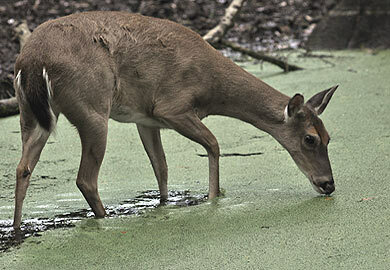 SCDNR has partnered with Auburn University for years to conduct deer studies. Jeff Sullivan conducted the study while working on his M.S. at Auburn University under the direction of Ireland Professor of Wildlife Ecology Dr. Steve Ditchkoff. The study was conducted on the Brosnan Forest Conference Center, which is owned by Norfolk Southern Railway and is located in Dorchester County. "The property is actively managed for timber and wildlife and has been involved in deer research with Auburn University and SCDNR for a number of years," Brosnan Forest General Manager Josh Raglin stated. Sullivan's study involved capturing does and fastening GPS collars around their necks. During the three-year study, approximately 40 does were captured with the average age being around four years old. The GPS units were programmed to record a location every 30 minutes and, over the course of the study, more than 160,000 locations were recorded. Results of the study indicate does exhibited changes in behavior, movements, and space use related to breeding. Does typically increased movement rate, probability of activity, and likelihood of being out of their seasonal home range as their dates of conception approached. Additionally, about half of the females made an excursion and temporarily left their home ranges around their conception dates. "It appears that does may exhibit these behaviors as a form of mate choice, not necessarily to pick a particular buck, but rather to increase the pool of potential bucks," Sullivan said. "The study also looked at the impact of hunting pressure on doe movements. Our data show that deer have the capacity to recognize and respond to localized threats posed by deer hunters in the immediate area around deer stands, food plots, and feeders. They do this by altering behavior, space use, and the times they use these areas (night for example). Furthermore, it appears that how deer respond to these localized risks is a result of the number of times a stand is hunted, suggesting that deer are capable of recognizing even low levels of localized pressure from hunters and modifying this information following additional experiences. Some deer hunters may have already believed this was the case, but we now have solid evidence supporting it." "Jeff did a great job on this project and we are in the process of working with Dr. Ditchkoff at Auburn University and the folks at Brosnan Forest to continue using GPS technology to better understand how environmental factors such as weather, moon phase; etc. affect deer movements and behaviors," Ruth added.